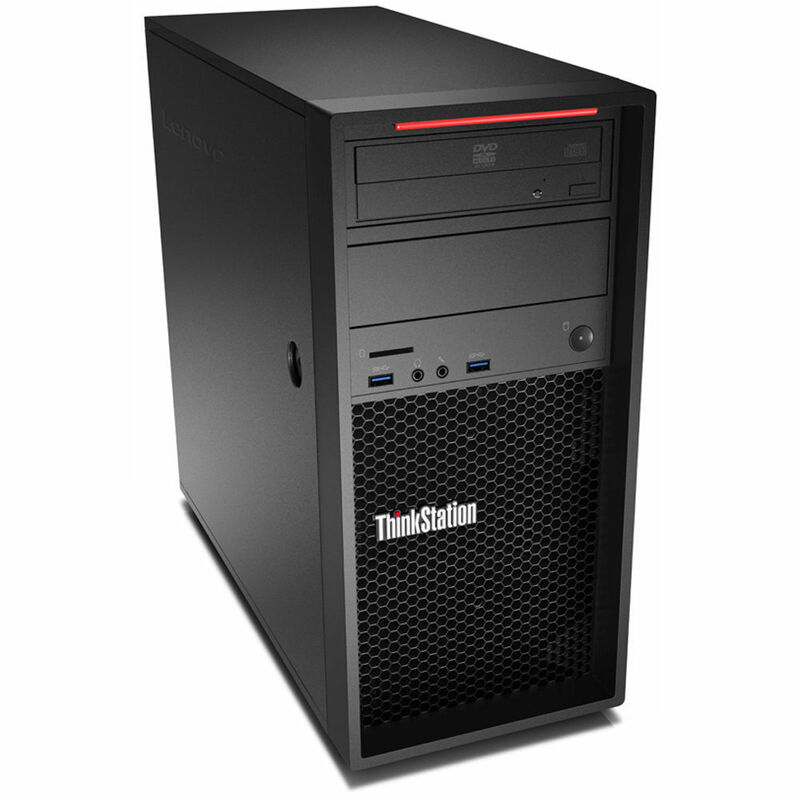 The ThinkStation P320 Series Tower Workstation from Lenovo is a reliable, stable, configurable, and scalable system that also boasts productivity features, is VR-ready, and ISV-certified. The system is powered by a 3.6 GHz Intel Core i7-7700 Quad-Core processor and, if you need more power, it can deliver extra performance by increasing the clock speed up to 4.2 GHz utilizing Intel's Turbo Boost 2.0 technology. The 8GB of 2400 MHz DDR4 RAM allows the computer to run multiple applications simultaneously and also to quickly access frequently used files and programs. This ThinkStation P320 Tower is able to support four 288-pin DIMM slots and the current 8GB memory configuration is made up of 1 x 8GB module, which can be upgraded to 16GB per slot for a total of 64GB of RAM. For long-term storage of your files, this system is equipped with a 1TB 7200 rpm SATA III 3.5" hard drive. If you want to add external storage drives or other peripherals, the ThinkStation P320 features six USB 3.0 Type-A ports, two USB 2.0 Type-A ports, and one serial port. For users who wish to add additional components to the drive bays, there are a total of two external bays that support both 5.25" and 3.5" components, plus two internal 3.5" bays. The integrated Intel HD Graphics 630 chipset delivers a sharp, clear picture while allowing for a multi-display setup to be utilized via its two DisplayPort and one VGA video outputs. Whether you are listening to music, watching a movie, or playing a game, the integrated Realtek ALC662 audio controller outputs high-definition audio and delivers higher fidelity than standard audio controllers. When it comes to mission-critical systems and performance, you can count on the ThinkStation P320. Featuring a 3.6 GHz Intel Core i7-7700 Quad-Core processor, 8GB of 2400 MHz DDR4 RAM, a 1TB 7200 rpm SATA III 3.5" hard drive, and the integrated Intel HD Graphics 620 chipset, this workstation is VR-ready, scalable, and can be configured to meet your business needs, both now and in the future.